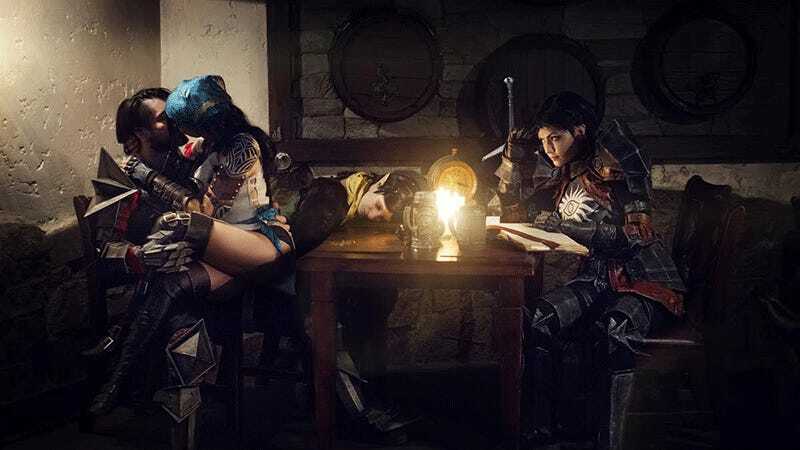 This merry band of cosplayers figured that if they were going to get together and dress up like Dragon Age characters, they may as well act like them. All photos by Anton Timofeev. Cosplayers are Sons of a Gun Cosplay (Hawke, Isabela), Ren Sinclair (Merrill) and Dark Incognito’s Cassandra, which we’ve actually featured here before. I’ve seen some good Dragon Age cosplay in my time, but holy cow, this Cassandra Pentaghast is good. After the battle with Nightmare in the Fade, Hawke leaves Skyhold to warn old friends that Corypheus is still alive and dangerous. He meets Merrill and Isabela in a cozy tavern like in the old days. Cassandra tracks them down and once again demands Hawke to join the Inquisition. But... they end up getting wasted. Doesn’t matter how the story gets there, so long as it gets there in the end.